Zachary Farley is one of our new contributor , He will mainly contribute articles in python language. Hope he will be able to help you guys in python concepts. 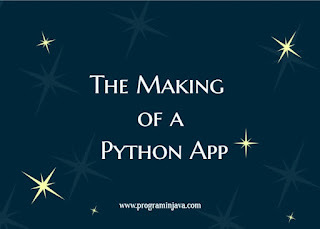 Let see this first article about Python App. Greetings readers. I’m a beginner self taught programmer. A year ago I decided to take up python as my first programming language because it’s a beginner friendly language. 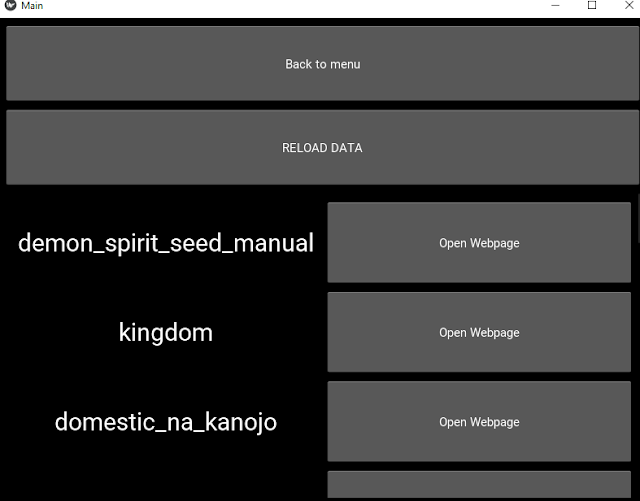 To make learning the language easier I decided to design an App to make managing my hobby easier. I enjoy reading online manga during my free time. I find so many great new content released that I have trouble keeping track of it all. Normally I would add new content to my favorites bar but eventually the listing would get so long it’ll clutter up my other favorites bookmarked.Plus more times than often I’ve lost track of new chapters released by the authors. To combat this issue I decided to develop a desktop application I could use to keep track of new series I find. The builder module allows the layout and the code to be separate by storing it in a. kv file, keeping the code clean and less clunky. The function used for the application was Builder.load_string(). 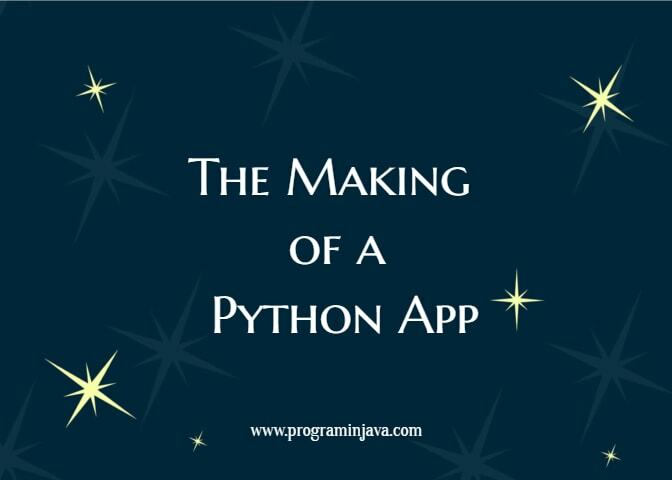 This function loads the layout within the python file instead of using the. kv file. Along with the builder.load_string() function numerous other functions play a key role in bringing the app to life. 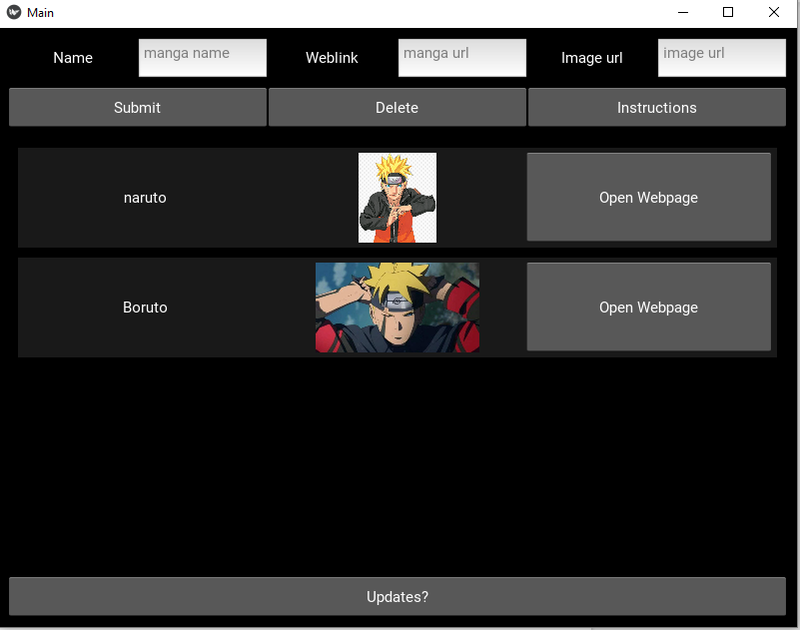 Along with the functions to run the app there are layouts that make up the graphical user interface. 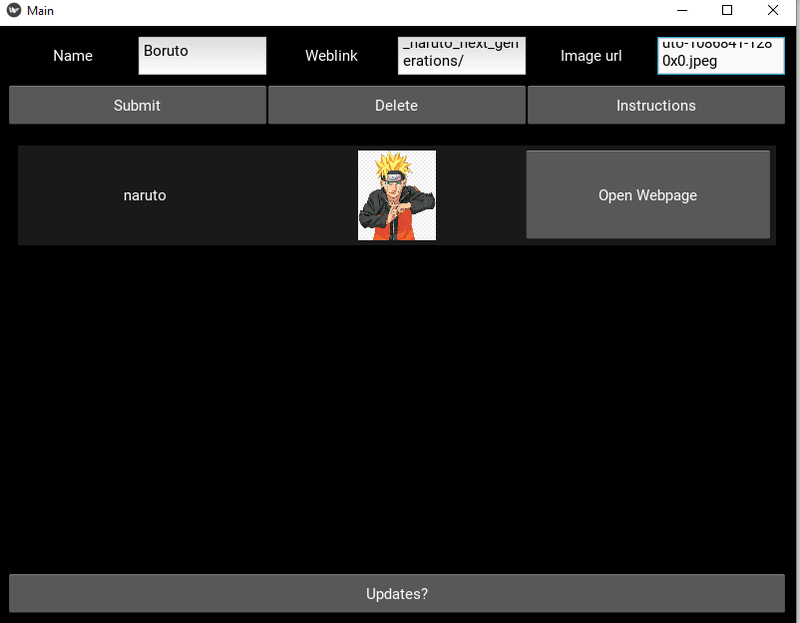 The form uses BoxLayout to place a label and text_input widget together to collect user input of the name, URL and image or image address of the user. Once the information is collected and the form is submitted the information then goes to a SQLite database (DB). 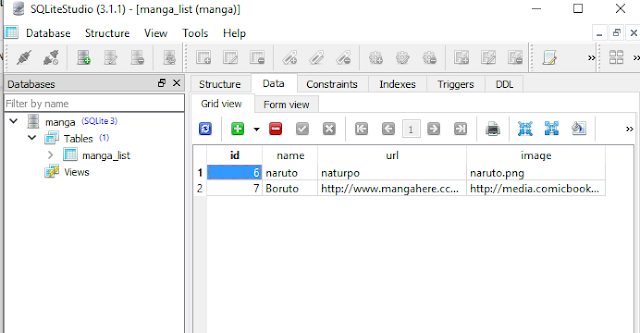 Once the information gets to the DB a method within the main class runs the SQL statement “select * from manga_list;” which pulls the newly inserted information. Once the data is retrieved from the table a row is populated containing 3 widgets: Label, Image/Asyncimage and Button. The label widget takes user input to populate the text property of the label class. 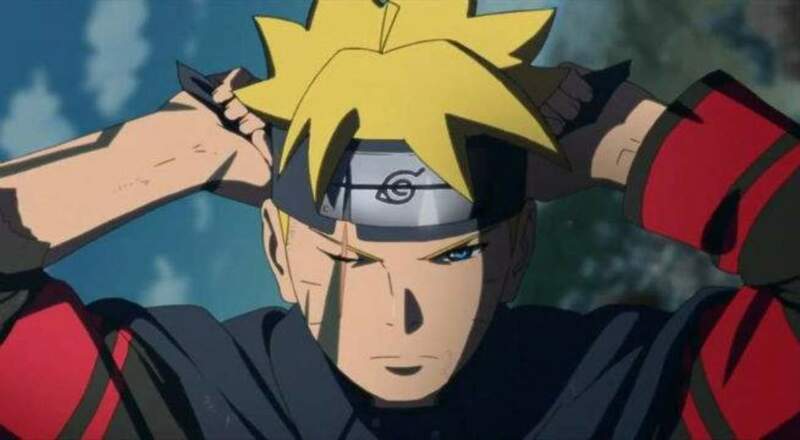 The Image widget uses either an image address (ex: http://media.comicbook.com/2018/02/boruto-1086841-1280x0.jpeg) or an image in the local image directory (C:\appfolder\images\boruto.png) which is populated when the application is ran on a new user machine. When selecting the “Updates?” button at the bottom of the window the screen changes with the help of the screen manager module within the kivy library. The updated screen uses the web scraping feature of the beautifulsoup python module. 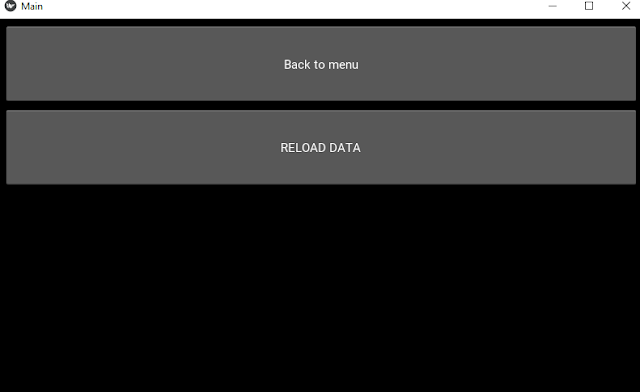 When pressing the REALOAD (reload) DATA button the application uses the website “mangatown.com” to look up the most popular updates that have come out, and then populates the information in the window. Similar to the previous screen the web crawler looks for specific classes within certain HTML tags. In the below box the chapter_list variable looks for <div> with the class “manga_text_content” and turns the info into an iterable array. Then the variable hot_updates looks for the class ‘hot’ within that array. A basic understanding of HTML coding is needed to obtain the the information desired. Of course each website has its own set of terms and conditions that either allows or disallows web crawlers to search through their website. Using pythons built in SQLite3 module I stored all the information submitted from the user. SQLite allows for easy connection to be made without needing to set up a database server such as mysql. It creates a lightweight database file with the extension “.db”. To connect to the DB, the python file and the “*.db” file need to only be in the same directory. Just as a final check to confirm the data is stored where it should be, SQLite Studio is the database management system used to view the contents without needing to command line. For easy distribution to windows systems Pyinstaller was used. Pyinstaller collects the libraries and packages used by the script and allows an executable to be made that will allow launching to any windows pc system. The following command produced a single application that executes beautifully when clicked. For more information on the parameters used when executing the command, please refer to the Pyinstaller docs.